We all have that one recipe. The one that doesn’t even require a peek at the recipe card. The one that’s your standby and always saves the day when you have no idea what’s for dinner. You know what I mean. 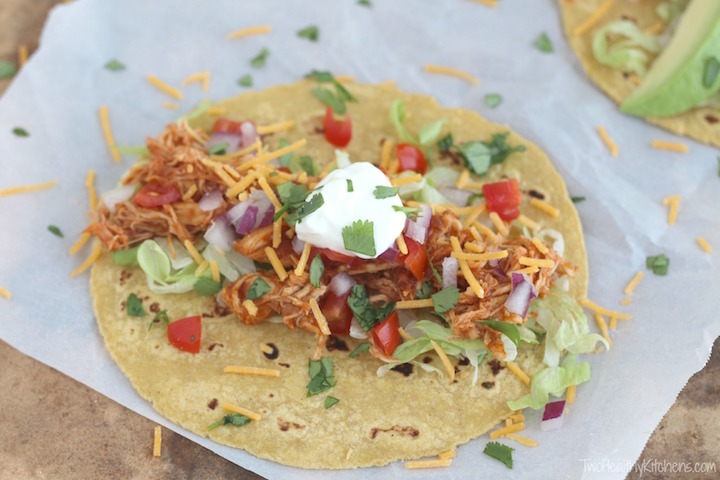 At our house, these Crock-Pot Chicken Tacos really are “that one” recipe. The one that never ever fails to be awesome. The one that we are always excited to eat. True story: When my little ones dash into the house after school, if their first whiff of home is the incredible aromas of this chicken … well, they do that silly fist-pump move where they make a fist and say “YEAH!! !” while pumping an arm up and down. Uh-huh … that really happens … because it’s sooo goooood. I was sure everyone on the earth had the recipe for my go-to. It was super popular on Pinterest a few years back, and I tell pretty much everybody I talk to about it. So, I just assumed everyone must make this constantly. If Shelley didn’t know anything about this, we realized there must surely be others out there whose lives have a similar gaping hole. But no more … today we’re gonna fix that! So this recipe. This is the one that I make all. the. time. Best part? It goes in the crock-pot. Yes, friends. We’re talking a 5-minute prep, and then you just let your slow cooker work its magic. You’ll just need another 5 minutes to finish the dish before you sit down to eat. Serious. I went back and scoured my Pinterest boards, my pins, my notes – and I can’t figure out who to credit for this awesome recipe. In my research, I saw a reference that Weight Watchers had a recipe like this years ago, so we decided that must have been the genesis of the whole idea. But a Google search and a search of the Weight Watchers site didn’t yield a similar recipe we could link to for this. Ah, well … we’re gonna give them the credit, anyway! In typical THK fashion, we both needed to test this recipe before we shared it with you all. At first, Shelley was a little skeptical that something so incredibly simple could taste so good. But, she called me before her family was even done eating. They were loving it. Loving it. I’m so excited her family gave the thumbs-up (possibly with fist pumps, too) – because now I get to share this recipe with you! Ok. Get your pens and paper, because you’ll want to take very good notes here. I totally think this’ll become your “go-to” recipe. Shelley’s made it multiple times since that first (fist-pumpin’) night. And I just know it’ll soon be your fave, too! Looking for More Crockpot Chicken Recipes That’ll Make Your Life EASY? Is It Safe to Use Frozen Meat in Your Crock-Pot? Sprinkle taco seasoning over chicken. Cook on low (for 6-8 hours) or high (for 4 hours). Just before serving, use two forks to shred the chicken. Stir to evenly distribute salsa throughout chicken. Serve immediately with desired toppings. We recommend avoiding taco seasoning mixes that contain MSG. Also, there are differences in the amounts of sodium (and other ingredients) in various brands, so it's a good idea to read the nutrition information for the brands offered at your store. How much taco seasoning do you use? A whole packet? Or do you make your own? I never comment but I just had to let you know how much I appreciate you for this – it’s perfect and my whole picky family LOVED it. You have literally changed my life because now I get to eat tacos every week. What’s greater than the gift of tacos? My last comment never even got posted, forget the question in it replied to. I made it that way anyway, with extra taco seasoning and tomato sauce instead of salsa. OMG. That is some fantastic chicken. I turned mine into nachos with a creamy queso sauce. Tastes like something that should have cost double what I actually spent, both in terms of time standing in the kitchen and in terms of money. I didn’t make it for a group, just for myself, let the chicken cook while I was at school (the life of a busy college student, lol) in 2 days I have eaten over half of it, and the leftovers are just as good. DEFINITELY something I will be making again. It is ok, the question was not super important, and the recipe is wonderful, I had the entire batch gone by myself in 5 days, and will most likely be making it again before years end. It even gave me the idea to cook chicken in the crockpot just covered with water when making other chicken dishes. I got most of December off between fall term and winter term, will make a nice break. I JUST got the crockpot last June, and only in the last couple of months have I really started using it a lot, the more I use it the more I like it. Such a simple recipe! I just finished shredding and my chicken breasts were falling apart with a spoon!! I doubled the recipe for my husbands potluck tomorrow and I found myself still needing a few sprinkles of a 3rd taco seasoning packet. Now I’m typing out my review while stealing a few pieces 😜 Hopefully it tastes just as good reheated in the crockpot tomorrow morning! Thank you! Hahaha! When I read the ingredients, I thought, “Where do I get 11.25-oz. package of taco seasoning? Is there such a thing? Isn’t that too much?” Then I looked again, and saw it was 1 (one!) 1.25-oz. package, which is what they are! Some things are just too funny not to share. By the way, I’m making this tonight for my husband (with a 1.25-oz. package of seasoning) because it sounds really good. He’s going to love it! Oh, yes he did! We both did, and I’m really glad to have a new recipe to add to my collection. Thanks so much! I love tacos! Especially chicken tacos. Taco Tuesday’s anyone?! Crock Pot meals are my favorite! Especially with school starting up! This one I must keep around to have weekly! Nice to have those kind of recipes, especially the ones your kids are super excited about! Looks simple and yummy. I just got back to New Orleans and the hubs has been asking me to make tacos. I asked him how come he didn’t just make them and he said because I make them better. I can’t wait to surprise him and try this new recipe! I need to try this! We’ve been working on our honey-do list and it’s eating up our time! By the time we’ve completed a project we need an easy meal waiting for us! And tacos is a great reward for a hard day’s labor! My 3 year old is obsessed with tacos, so we usually have them at least once a week. Add in the ease of a crockpot dinner, and this sounds totally perfect. Adding it to the dinner menu for this week! It’s awesome when something easy to prepare becomes a family favorite. I love this recipe. I also make it with a small or medium pork roast.. Like you, I can’t remember where I first heard about it. I just know that it’s easy and delicious. I’m all about simple easy recipes these days and these fit the bill! I’m excited to try them because I have everything I need to make them at home! I’ve never had this before but I’m seriously going to change that this week. I work third shift so I am in desperate need of super easy yet delicious recipes like this one. I can’t wait to try it! Shredded chicken, taco seasoning and salsa! The holy trinity of taco awesomeness! So easy to make with clear instructions like these! Love this! Just what I need for those nights I want dinner quick and simple. They look irresistibly good. We make this almost every week. It is one of our favorite meals! Did you use non frozen chicken or frozen? Hi Lerin! This is a great question … with a bit of a lengthy answer. At least thus far, we’ve opted not to include nutrition info, although we’ve actually debated about this issue since the beginning of our blog (and we address it in our FAQ at http://twohealthykitchens.com/about/). 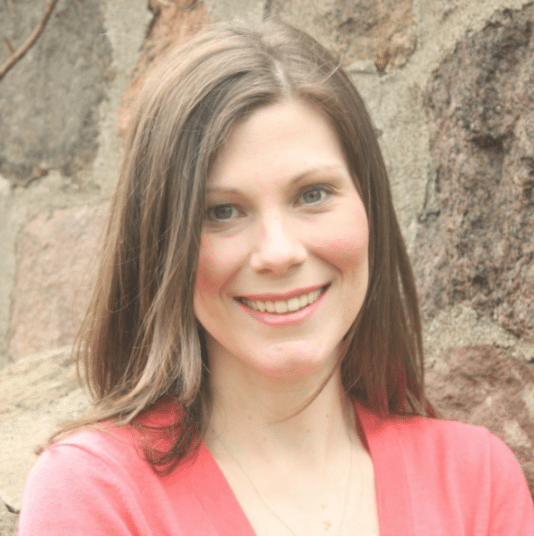 Especially with Gretchen’s (my original business partner’s) master’s degree in nutrition, she could easily have calculated all this manually – plus there are loads of online calculators to use. However, for a variety of reasons, we have decided over and over again not to do that. One big reason is that we generally don’t specify exact brands (although on some occasions we need to), so the final nutritional profile of a recipe can vary widely, depending on the purchasing decisions our readers make. In the end, it could almost be a bit misleading to quote nutritional info, if readers make significantly different purchasing choices than we did in testing. For example, the final nutritional profile of these very simple 3-Ingredient Crock-Pot Chicken Tacos – could vary tremendously (particularly, in this case, the sodium) depending on which taco seasoning and which salsa someone purchases. Thanks so much for reaching out to us! I hope this explanation helped you out at least a little! I make this all the time. But I use JUST salsa and I add a half a brick of cream cheese the last 5 minutes. Delish! Can u use chicken tenders besides Breast. I made these today and used the 4 hour on high method and….. I CANNOT wait for it to be done! (30 more minutes). It makes my apartment smell so amazing and it will be ready just in time for when the hubby comes home from work! We’re going to be making tacos tonight and tomorrow packing up taco salads for lunch…. YUM. Easiest, least messy way for taco nights. New favorite and I will never go back! 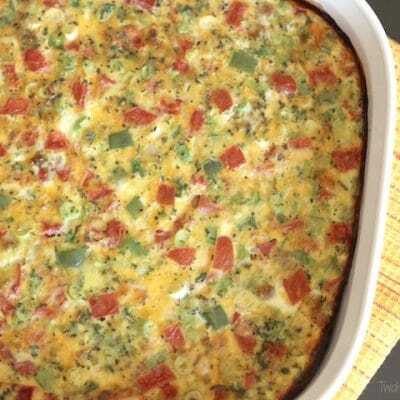 I have a friend that on facebook asking for easy recipes since they have 3 kids in sports band…always on the go, someone posted this recipe and me and my husband working 12 hour shifts thought it was perfect, we throw (sorry to say we have used frozen chicken) but we put it in the crockpot at 6am on low, get home at 7:30 shred it up and its awesome. So easy and its nice to come home to something cooked instead of cooking and eating at 9pm. Very easy love it! I love this recipe. Tried it once before and got it going in the crock pot again now! I love doing mine in lettuce shells! So refreshing! Hi Jessica! Sounds like such a fun party! I’ve actually done exactly what you describe – making these Crock-Pot Chicken Tacos, plus regular ground beef on the stovetop – for a beach house full of about 20 family members. It worked beautifully! We started the Chicken Tacos earlier in the day, and they were perfect by dinnertime – so easy and ideal for a taco bar! Just double or triple the entire recipe – each ingredient – depending on how much you decide you want. I’m really excited for you to try it! Also – I imagine you mean that you’re hoping I also have a beef taco recipe?? I’m sorry – I don’t. But, if you want to make that ahead, too, I would just prepare the beef taco mixture on the stovetop the way you usually do for tacos, store it in the fridge, and then reheat it in a big batch right before serving. You could even reheat it and, once it’s piping hot again, place it in a second slow cooker (not the one you’re using for the chicken 🙂 ) and keep it hot on the taco bar that way. 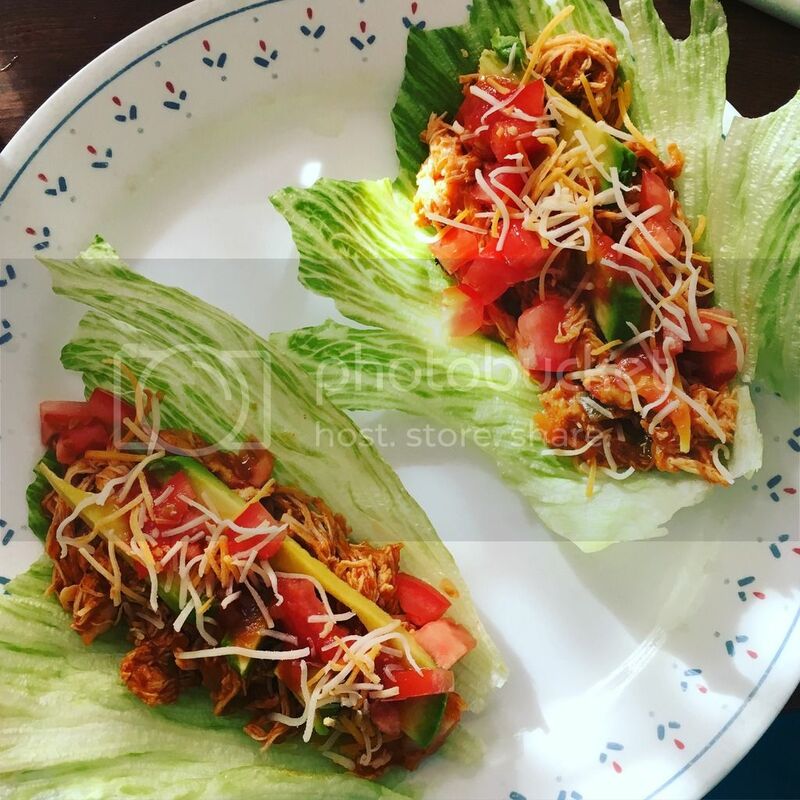 As a side note, we do have another taco bar recipe for the slow cooker that you might like to try another time: Mediterranean Crock Pot Chicken Taco Bar (http://twohealthykitchens.com/2015/10/22/mediterranean-crock-pot-chicken-taco-bar/), and also a recipe I’ve used at a neighborhood potluck to feed a group: Easy Crock Pot Chicken Burrito Bowls(http://twohealthykitchens.com/2015/09/10/easy-crock-pot-chicken-burrito-bowls/). 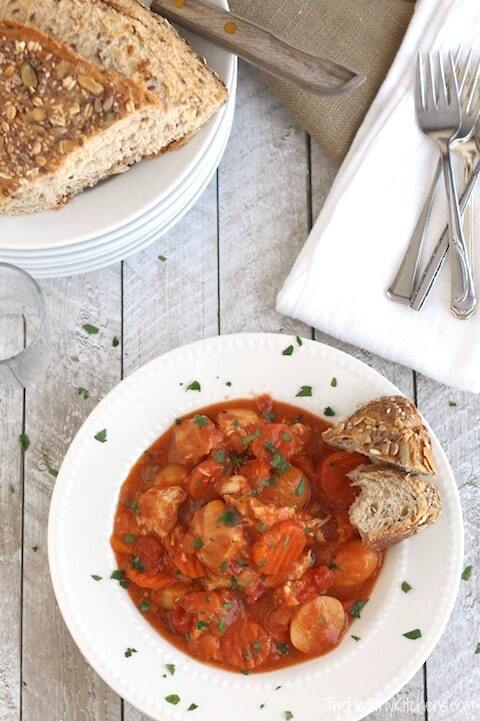 Once you get in the swing of using your slow cooker, I think you’ll really fall in love! 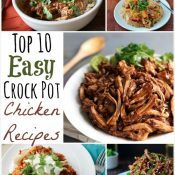 When you’re looking for more slow cooker recipe ideas, check out our whole slow cooker category at http://twohealthykitchens.com/recipes/index/crock-pot-slow-cooker/ – lots of yummy (easy!!!) 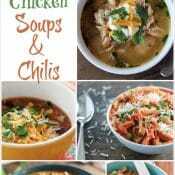 recipes for soups, stews, chilis, sandwiches … even appetizers! So easy and it looks so yummy! We’ll be trying this out this week. Thanks! 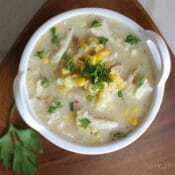 Oh delicious, i love this sort of food, Great recipe. These look awesome and I am always looking for something different to make with chicken. I have always had beef tacos so this will be great. And you can’t ask for better than a “crock pot” meal. If I start with frozen chicken breast halves, can I let it cook on low for 11-12 hours? I have quite a commute to/from work. Should I add more salsa or chicken broth if cooking that long? Thanks! Slow cooking is new to me, but I too have an hour commute. If I put this in the crock pot at 7am and don’t get home till 6pm is ok to cook on low this whole time? Hi, Lando and Ashley! Thank you so much for the great questions, and – Lando – my apologies that we somehow missed answering your comment sooner! So, to start, we really don’t recommend that you use frozen meat in any slow cooker recipe, for food safety reasons. 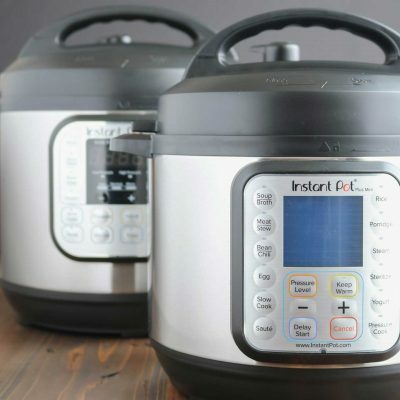 You can read more about that in our post “Is It Safe to Use Frozen Meat in Your Crock-Pot?” (here: http://www.twohealthykitchens.com/2014/02/03/is-it-safe-to-use-frozen-meat-in-your-crock-pot/). Neither Gretchen nor I have ever tried cooking this recipe for as long as 11-12 hours, so we can’t guarantee how it will work. Our only real concern in cooking this recipe for so long is just that, with such a small amount of overall liquid in the recipe, the meat may begin to dry out and get tough. Your idea, Lando, of adding a bit of broth to help with this problem might be a really good solution for such a long cook time. If either of you try it – we’d love to know how it worked! A couple of other ideas: If your slow cooker has the option of switching to “keep warm” after cooking, that might buy you an hour or two, but you generally don’t want food held at that setting for more than a couple of hours at most (check your slow cooker’s manual). Lastly, you could always make this chicken taco recipe on a weekend day when you’re home, and reheat it after work during the week. Not quite a perfect application of the slow cooker for long work days, but it would definitely solve the problem, as this reheats really well! I hope all of these ideas help, at least a little! And again – thanks so much for popping by and for asking terrific questions! I have a long commute to work as well. I put a slow cooker bag in my crock pot, load it up, and let it cook all night while I sleep. In the morning I just lift the whole bag out of the crockpot and put it in a container. When I get home from work, I just have to heat it up. It takes the guess work out, and I never have to worry about my food drying out or overcooking. Is there any way to make these delicious tacos any easier? YES! Instead of shredding with two forks, let your hand mixer do the work. It shreds any meat perfectly! Crockpot chicken is my goto in general, chicken and noodles, buffalo, tacos; though I usually dump a tub of spicy queso dip on instead of salsa because I’m allergic to tomatoes. 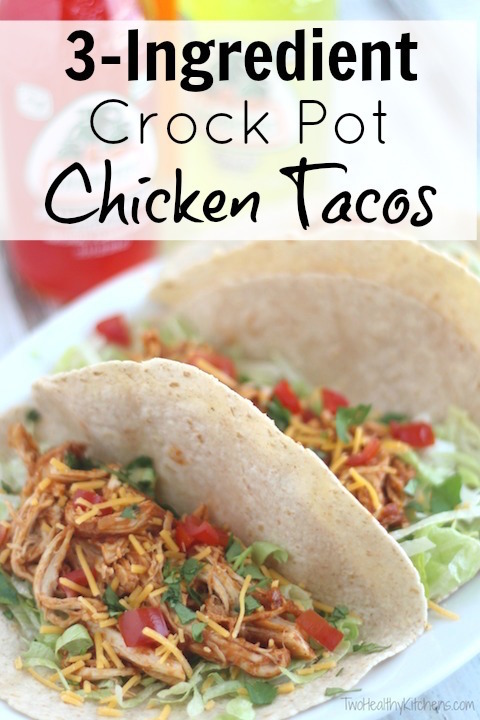 What is the calorie/nutritional content for the 3 ingredient crock pot chicken tacos? Thanks for the response and feedback! I used 5 fresh chicken breast I just bought from the store and pace medium chunky salsa. The only difference was that I blended the salsa in the food processor to get rid of the chucks because I have picky eaters in the house but that actually made the salsa thicker. I’ve had this issue when trying to do BBQ pulled chicken as well so I’m wondering if my crockpot cooks hotter than the usual low setting? Hello!! I think you may be absolutely right – I’m guessing your crock pot is getting really hot, and there’s a lot of steam buildup that can lead to mushy food. Since it sounds like there wasn’t an over abundance of liquid, perhaps you could try cooking for a bit less time. Does your slow cooker have a small hole in the lid? I have several (it’s more of a collection … I just love cooking in crock pots and always need to have one ready to go!) and one I use often has a small hole under the handle – to allow steam to escape, and so there sin’t a vacuum effect with the lid and the bowl. It’s very tiny, so it’s not losing a lot of heat, but there also isn’t a buildup of steam inside. I’ve seen some articles in the past that suggest taking the lid off for a few minutes every couple hours. This allows some steam to escape, but then also cools the food and slow cooker itself, so it’ll take some time for everything to come back to the right temperature. I don’t think that’s the best idea … but I wanted to share it with you. I’m sorry that I can’t be of more help! You must have a super-charged slow cooker!! 😀 As long as your food comes to the appropriate temperature, the slightly shorter cook time may be your best bet! I followed the recipe to a “t” and I found that there was too much liquid that when I shredded the chicken it became soggy. I didn’t see any other comments with regard to this issue so I’m confused at where I went wrong? Overall flavor was great but chicken texture wasn’t pleasant. I’d love to give this recipe another try just looking for some tips to prevent this from happening again. Thank you! – Was your salsa particularly liquidy? Perhaps a thicker, chunkier-style salsa may help! I tend to use a thinner salsa, but if it’s too thin it could become too watery. – What type of chicken did you use? Some brands of chicken inject broth or water into the chicken breasts – the packaging may read, “Enhanced with 15% chicken broth” or similar wording. Brands claim this will help with a juicier and better tasting chicken breast, but I usually skip over the ‘enhanced’ meats. I’ve not ever had an issue with ‘un-enhanced’ chicken being too dry or under flavored. However, if you used this type of chicken, the extra liquid may be causing the sogginess. – Was your meat completely thawed? We’re super passionate about using totally thawed meats in crock pots here at THK (we’ve even written about it here!). If your chicken was even a little icy, the extra liquid that would melt off could cause the unpleasant texture, as well as some other issues discussed in our other post. What is your favorite jar salsa for this recipe? Hello Ilka! Honestly, I don’t have a favorite salsa for this recipe!! I know it sounds funny, but I always just use what I’ve got on hand. I tend to buy a lot of salsa at Trader Joe’s, but sometimes I’ve only got my local store’s brand in my pantry! This sounds delicious. Did you use raw or frozen chicken? Hi Tammy! Great question! We always, always use only raw, completely thawed chicken. While it may seem convenient to toss frozen chicken in, it’s never a good idea. We’ve even written a post about not using frozen meat in your crock pot! Simply put, frozen meat spends too much time hovering in the ‘danger zone’ (40F-140F) since the crock pot would need to defrost it before it can begin cooking it, and it could lead to bacterial growth in your food. Super yucky and not at all appetizing. So for this (and all other crock pot chicken recipes!) use totally thawed meat! Oh, wow! First off, you are so incredibly awesome to tackle dinner duty while your wife snags some sanity time! I can sure relate to how happy she must be! I know that one day I’ll dearly miss hearing “mom…mom…mom” but it sure can get exhausting at times – lol! So thrilled that you’re giving these chicken tacos a try! One thing that’s awesome about this recipe when you have kiddos is that each person can tailor this to exactly how they like to eat tacos – you can spice it up with hot sauce, add lots of great veggies like lettuce and tomatoes … whatever! And, I’m not sure how young your kids are, but one other little tip that sometimes helps if one eater in the family is particularly suspicious of spices or salsa: before you start to shred the chicken, just set some of it aside for the “pickier” eater, and don’t mix it back into the flavorful salsa mixture in the slow cooker. That way, their portion will be a little more plain and they can flavor it up however they feel most comfortable. (We’ve written several posts on picky eating and spoken about it for some parenting groups, so we totally know how one little tip like this can save a parent’s sanity! 😀 ). Can’t wait to try this! Fyi, you can make your own taco seasoning. I do pico de gallo, sea salt to taste, probably around 2 tsp. Of cumin and about 1 1/2 tsp. Of garlic along with a homemade chili powder to taste. I’ve been told it tastes better than buying premade taco seasoning! It was great! We added more cumin and garlic than what posted. We also didn’t have enough salsa so i used 1 can of rotell original diced tomatoes with green chiles and 1 can of rotell cilantro lime diced tomatoes with green chiles. It was fantastic! We ended up with extra meat that we mixed in with homemade spanish rice and made 2 more meals for us!!! Great recipe. Love the versatility of it! Oh, wonderful, Lara! I’m so thrilled you loved this recipe, and it was really, really sweet of you to stop back and let us know! I enjoyed your update on the different personal twists you used, too! 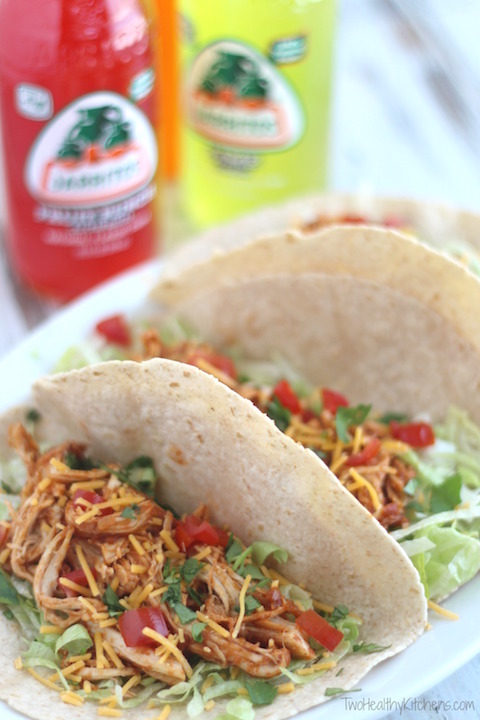 Truly – the flexibility of these Chicken Tacos is so fabulous – totally customizable! Oh – and you got me thinking … if you love this recipe, make sure to check out our Crock-Pot Chicken Tortilla Soup – it was actually based on this Crock-Pot Chicken Tacos recipe! 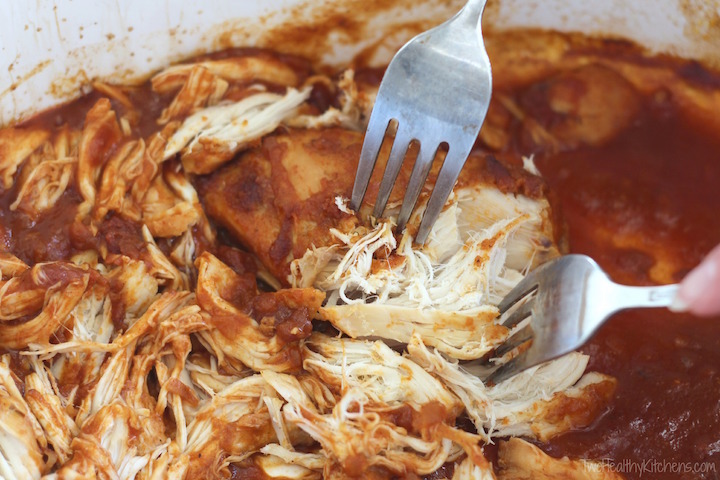 And actually, along the same lines, we have a recipe for slow cooker Chicken Burritos Bowls that was published in the cookbook you can download when you sign up to receive our e-mails (you know – in that little box toward the upper righthand margin of our site). I didn’t hop over to our subscriber list to see if you’ve already subscribed and received your ebook, but if you haven’t, you might check that out, too! 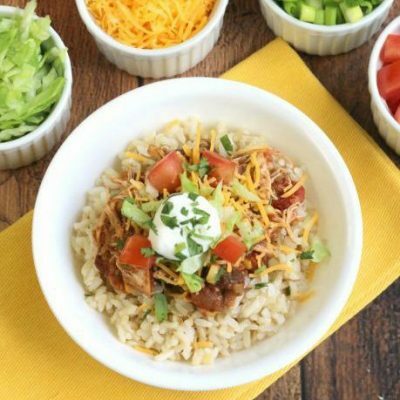 The ebook is gorgeous and has loads of great slow cooker recipes (not just our Chicken Burrito Bowls! 😀 ). Anyway – I know that’s a lot of info, but since you enjoyed these Chicken Tacos so much, I thought you might like the Tortilla Soup and Burritos Bowls, too – they both have lots of wiggle room for customization (spicier salsas, etc.) – which sounds right up your alley! I look forward to trying them soon! I still have 2 lbs of chicken to use! This is the perfect kind of dish I like to serve at a party. Easy on the cook, but tasty for the guests. And, I like to let people make their own so they can put whatever they want in the taco. Thanks for the recipe. 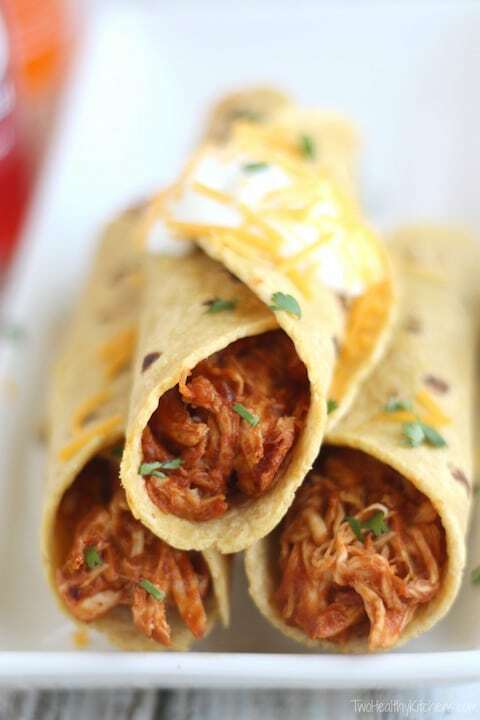 I wanted a easy recipe for chicken taco meat and I found it. I made this for our work Christmas party and it was fantastic!! I loved your humor inthe directions and when I was asked how I made it, I quoted directions exactly as you did!! Hello, I do not have a crock pot but I do have all other ingredients is it still possible to make? I bet you could simmer it on the stove top and get the same result! If you’re simmering it you might need to add more liquid to it.. just keep an eye on it. I almost attempted the simmer method yesterday when I was short on time (was making it for lunch). I will try that, thank you. I needed an idea for dinner and this sounds perfect. I don’t really want to run to the store with my sick two year old… but i only have half a Jar of salsa in the fridge 🙁 think half the salsa and adding a small can of Rotel would work? I went ahead and threw caution to the wind and went for it! As it turned out I had a tad under half a Jar of salsa left (my husband eats that stuff on everything!) I went ahead and dumped the salsa, an entire can of Rotel (even the juice) in with it. Since I had less salsa than originally thought I diced up small pieces of onions and added half a can of crushed tomatoes too. (Talk about a crazy substitution day!) We also cooked on high because I needed it ready for lunch. Smelled delicious cooking, and despite all my changes actually came out awesome! I think the Rotel gave it more spicey flavor than the entire jar of salsa would but my family likes a little kick. I think the Rotel worked great in a pinch! My little ones ate it up on soft shells with lettuce and cheese. Yum! My poor husband is going to be upset when there is no left overs for dinner lol. I ate mine on a salad and it was equally as delicious! I also made a corn and black bean “salsa” to go with it and it was awesome. The salsa is just a can of black beans (rinsed, drained) a can of corn drained and I used my other half can of crushed tomatoes but it called for freshly diced. Mix then add some cilantro and I squeezed two limes over it… yum! With the chicken it was over the top! It’s definitely going to be a staple in our house! We had leftovers today… i grilled the two year old some of the leftover meat between two small tortillas with a sprinkle of cheese. Hubs did a fajita style thing with it and the rest of us did salads and tacos. So versatile and yummy. Really you don’t even need to put it on something. I could eat it out of the crock pot with just a fork lol. My friend makes a similar version of this but said in the last hour she melts 1/2 brick of cream cheese in and makes a “creamy” version… also sounds delish (even though a bit unhealthier!) I’m so glad I found this recipe… who would have thought! And I think it got better the next day sitting in the juices! Wow! Just found your recipe and am so excited to try it. I’ve had my crockpot for 2 years and have just started to use it in the last 6 months. Everyone used to ask why I didn’t use it and I always tended to think that it was best to make soups (which my family are not big fans of). But I’ve now made beef and pork roast, bbq chicken drumsticks, etc. So I’m excited to add a new recipe to the mix. Just a quick question…Do you have a prefered salsa you use. Salsas taste and texture differ from brand to brand. Just curious if you have a favorite that works best with this recipe. Thanks! Great question! As far as the salsa you should use, well, that really depends on your own preferences. Love really zesty, spicy foods? Go for hot salsa! Not quite sure the spicy stuff is for your family? Go for mild! Honestly, I use whatever salsa I happen to have on hand – and it’s typically what is on sale! Personally, I tend to buy medium salsa, and usually a thinner style. Shelley goes for the salsa with more large pieces of veggies in it. Both salsas make it absolutely delicious! This recipe is a winner. Delicious, easy to make ,and inexpensive.I wasn’t sure a pound and a half of chicken would be enough to feed the 5 of us so I used 2 and a quarter pounds of chicken breasts. Believe me a pound and a half would have made plenty of tacos. For those that haven’t made this yet, when the crockpot finishes cooking the chicken, there will be a lot of liquid. After shredding the meat the chicken will absorb all the juice and you’ll be ready to have delicious tacos. Later on this week I will try the unstuffed pepper skillet. I made this for dinner yesterday and it was really good! I am going to make chicken tacos for a group of about 20 people tomorrow. Can you give me an idea of how much chicken I will need to make? Not sure how many people your recipe is meant to serve. Thanks! Hi, Jane! We’re so thrilled you’ll be making this – what a lovely compliment! Ok – so exactly how much you want to make honestly depends on the type of party and your crowd (and how hungry they are! 😀 ). For example, if it’s for a potluck and everyone will be filling their plates with lots of other foods, too, you will obviously need much less. 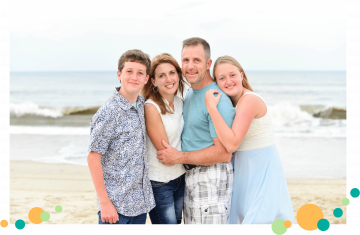 Also, if your group is like our families, and loves to pile on lots of (healthy! ), yummy veggie toppings like the tomatoes and avocados and lettuce, then you again won’t need quite as much. So, a ballpark would be that one batch of this should feed about 6-8 people. We’d suggest that you definitely at least make a double batch, probably a triple if you have a large enough crock-pot or (if you’re like Gretchen who has 7 or 8 slow cookers 😀 ), fire up two of them. (Make sure you carefully check the chicken for doneness if the crock-pot is really full.) Admittedly, though – when we entertain, we always like to have too much rather than too little, and this particular recipe reheats so well that we’re truly delighted to end up with leftovers of it! Great recipe, and so easy! Even my super picky daughter loved it! Do you use bone-in, skin-on chicken? This is easy, super healthy and so yummy!!!! thanks for sharing! Thanks for the great question! Our best guess is that this would work – although we’ve never actually tried it ourselves and can’t vouch for how it would turn out. 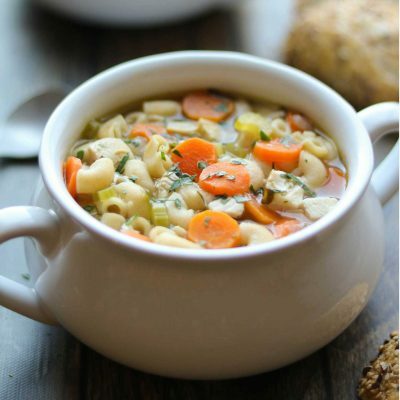 We did some research for you, though, and did find a few recipes around the Internet that use just seasoning and chicken broth, or seasoning with a combination of chicken broth and water. We wouldn’t suggest subbing out the 16-ounce jar of salsa for a full 16 ounces of water (and/or broth), though – maybe try starting with around a cup of liquid. Be careful that the chicken doesn’t dry out, though, since there will be somewhat less liquid for it to cook in. As we found when testing our Crock-Pot North Carolina BBQ Pulled Chicken Sandwiches, crock-pot recipes with such a small amount of liquid may not do quite as well on the high setting if you’re using a larger (say, 5 or 6 quart) slow cooker. It may work best for you on the low setting – but give it a try and see what works for you and your crock-pot! Also of course, you won’t have the same flavor boost from the salsa, nor the bits of onions, peppers, etc. that you would get if you included the salsa – so maybe you could stir salsa into the portion for the rest of the family if you’d like, or let the rest of the family use the salsa as a topping. Good luck! And if you have a moment – we’d love for you to pop back and let us know how it went! I can’t believe I still haven’t tried this dish after seeing it in January!! I am making this ASAP! Thanks for adding it to the linky party. Do you place uncooked chicken in the crockpot? Frozen or fresh? 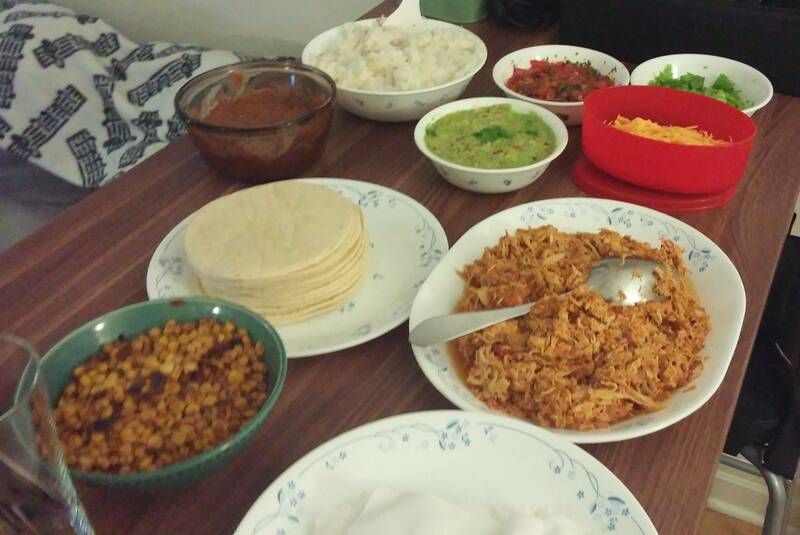 Also, I’m hosting a taco bar, so I was hoping to double the recipe, would that still cook alright in the crock pot? Since this recipe’s been posted, I eat these a lot, and they are super delicious. Thanks, THK! You’re kids are funny. My kids are similar when they come in the door and something yummy is cooking in the slow cooker. This is similar to something I make, only I use green chilies instead of taco seasoning. So easy and good too! I will try it your way next time. You’re blog is beautiful. I’m so happy you found me and now I can look through your blog at all of the possibilities! Hi Kathleen! Thanks so much for stopping by … and for your sweet words!! Ok. That’s it. I broke down and bought a crock pot in England. Not impossible to come by, but not as used as they are in the U.S. I plan to take your recipe and start a trend! Thanks for another great recipe! Okay is this frozen or thawed chicken breasts? Wow, this dish is so simple, and I am sure it is so full of flavor! I seriously put this together in the crock pot in less time than it took for my windshield to defrost this morning…(Start car, start crockpot, get in car, go!!!) It was really delicious! Our kids loved it! I wasn’t sure that they were going to leave any for their Daddy who was going to be eating later! Thanks for a great, easy, healthy recipe! I love crockpot recipes, so I will make this one very frequently! I can see this becoming my new favourite recipe! I make one with beans that the kids love but chicken would be the best!!! Thanks for sharing! Um, I’ve never heard of this so I’m REALLY glad you shared it. 🙂 It looks mad tasty. My husband loves tacos so I need to make this for him! The crockpot stays on the counter in my house; love that little thing! This sounds delish! Your little ones are so cute with the fist pumps 🙂 I make a similar recipes with chicken baked in the oven and then top it with cheese too. I’ve never tried it in the crock pot but it sounds like the perfect meal. I’m always looking for a good quick chicken taco recipe so I’ll have to try this next time. We just tried this tonight. So, so easy, and so so good! This recipe is going in our regular rotation for sure. Thanks! This is officially pinned. Trying to stockpile super easy recipes like this for when Baby #2 joins us and turns our world upside-down for a few months. Love it!! Oh my goodness, this looks SO good! 3 ingredients, are you kidding me?? Wow this looks so delicious love the shredded chicken texture – a bit like slow roast pork (but much healthier!). You have 6 crockpots! is that because they are all different sizes or because you like to crock-pot 6 things at once?! I’m guilty, Amy! Some are different sizes, yes, but I also have a few that are the same size! I can’t help myself! I really only use multiple ones when we entertain – then I get several going at once! 🙂 I walked into the store today and saw a big new display … I almost bought another one! I wonder if there is some type of support group for people who own too many crock-pots?!? Hello snappy dinner! Everyone needs to be armed with this recipe. Classic! I rarely comment on recipes unless I find them to be outstanding and this is just that – outstanding!!!!! For as easy and simple as it is, it’s amazing. Thanks so much for posting! Seriously, how do I not have a crock pot?! This looks so delicious and I can’t get over how easy it is! 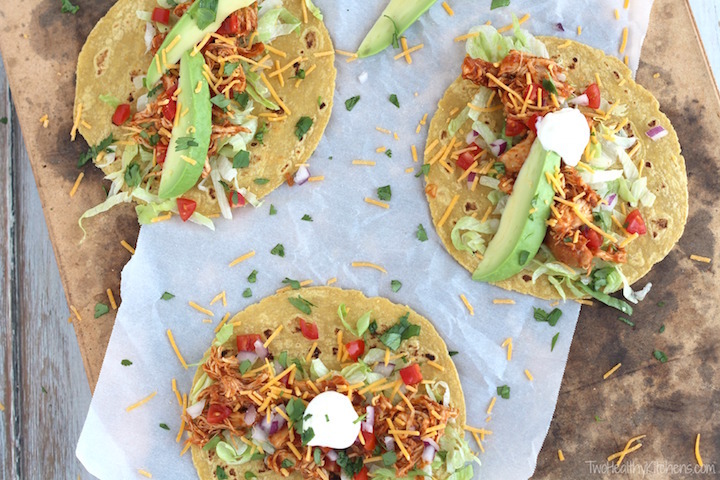 Putting it on my weekend to do list – buy a slow cooker then make these tacos! I still love you guys!!! Will be making this Monday! I also really enjoy the ravioli sausage and pepper dish!! Okay, I am all in on this one! Crock-pot and three ingredients-does it get any easier? I too love the welcoming smell of a dinner ready at the end of a busy day. Love how easy but tasty this recipe (totally pinning). Tacos are always a hit and a classic to fall back on. Can’t wait to enjoy! Great, easy slow cooker recipe!! As a busy Mom I fully appreciate these recipes. Thanks for sharing! What a great, easy, weekday meal! I’m definitely putting this in my go-to recipes for those hectic nights! What a great easy recipe! My go to is a quesadilla. It’s so easy and comes in handy on busy week night dinners. Lol, I can just imagine everyone running around fist-pumping! Isn’t it funny how some things just make everyone so happy it requires a fist-pump?! I love it! I know my guys will be loving this recipe, as will I. Anytime I can use a crockpot is a great day 😀 Pinning!! I don’t have a crockpot either but I do bake chicken or beef (when I ate it) overnight in the oven. Turns out perfect and you can vary up the seasonings. I love having it around because you can use it in almost anything! Great recipe, girls! These look incredible. Lucky kiddos! Maybe 2014 is the year I actually purchase a crockpot 😉 As far as my go-to dinner, I’d have to say a simple plate of scrambled eggs saves the day. We love having breakfast for dinner, too! Yes – in a pinch I often whip up some eggs, as well! Such a lifesaver!